Happens-before relationship is a guarantee that action performed by one thread is visible to another action in different thread. Happens-before defines a partial ordering on all actions within the program. To guarantee that the thread executing action Y can see the results of action X (whether or not X and Y occur in different threads), there must be a happens-before relationship between X and Y. In the absence of a happens-before ordering between two operations, the JVM is free to reorder them as it wants (JIT compiler optimization). Happens-before is not just reordering of actions in 'time' but also a guarantee of ordering of read and write to memory . Two threads performing write and read to memory can be consistent to each other actions in terms of clock time but might not see each others changes consistently (Memory Consistency Errors) unless they have happens-before relationship. How to establish happens-before relation? 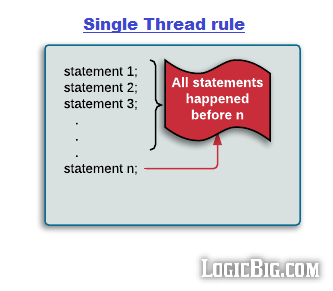 Single thread rule: Each action in a single thread happens-before every action in that thread that comes later in the program order. 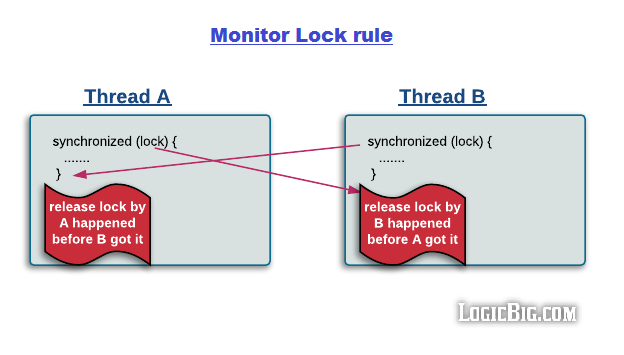 Monitor lock rule: An unlock on a monitor lock (exiting synchronized method/block) happens-before every subsequent acquiring on the same monitor lock. 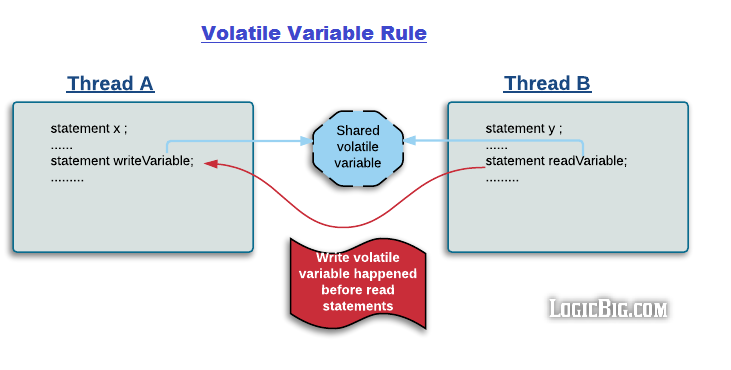 Volatile variable rule: A write to a volatile field happens-before every subsequent read of that same field. Writes and reads of volatile fields have similar memory consistency effects as entering and exiting monitors (synchronized block around reads and writes), but without actually aquiring monitors/locks. Thread start rule: A call to Thread.start() on a thread happens-before every action in the started thread. 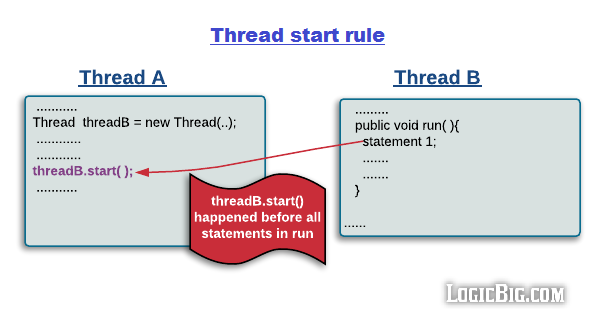 Say thread A spawns a new thread B by calling threadA.start(). 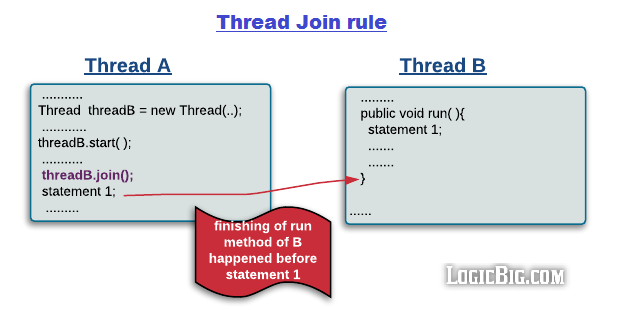 All actions performed in thread B's run method will see thread A's calling threadA.start() method and before that (only in thread A) happened before them. Thread join rule: All actions in a thread happen-before any other thread successfully returns from a join on that thread. Say thread A spawns a new thread B by calling threadA.start() then calls threadA.join(). Thread A will wait at join() call until thread B's run method finishes. After join method returns, all subsequent actions in thread A will see all actions performed in thread B's run method happened before them.